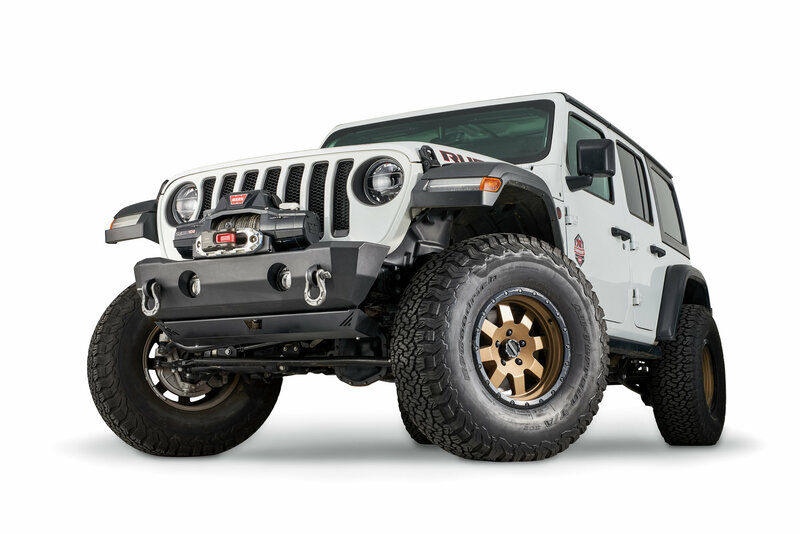 Warn gives you the ultimate in off-road front bumpers for your Wrangler JK & JL with their Front Stubby Crawler Bumper. This stubby bumper will give you plenty of clearance for larger tire to help you out on the tougher trails out there. Along with the extra clearance for larger tires you will being gaining better approach angles so you will not get hung up on an obstacle you may come across. Welded Shackle mounts give you extra recovery points as well as built in tabs for off-road jack points. This bumper will accept the factory driving lights. Available with or without grille guard. Construction: Constructed of high quality steel that is black powder coated for added protection. The black powder coating is a 5 stage process that withstands 408 hours of salt spray testing guaranteeing your bumper will withstand debris that you might encounter. Features: The features on this bumper make it a great off-road bumper that will far exceed your expectations. A winch mount that allows you to hold up to a 12000lbs winch along with high angled corners so you be able to take better approach angles. Shackle mount for added recovery points in case you find yourself in a jam along with built in tabs so you can jack up your Jeep on the trails if needed. Comes in two options with or without a grille guard in case you want added protection.